Time flies. The event I have been training for all winter and spring is now three days away. This Monday at the ungodly hour of 6:30 AM, I will begin the trek that will eventually lead me up the highest mountain in the Eastern United States. The ride leaves from Spartanburg, SC, and travels 74 miles to Mount Marion. That’s where the fun begins, as the remainder of the ride will be strictly uphill. After around 103 miles on the bike, I will finally arrive at the Mount Mitchell summit. 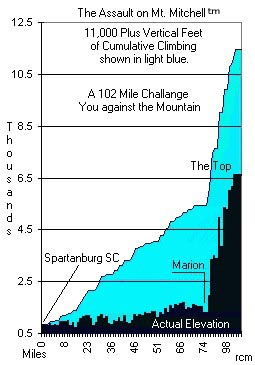 When the ride is finished, I will have climbed around 11,000 feet, the majority of which will occur during the climbing phase at the end. 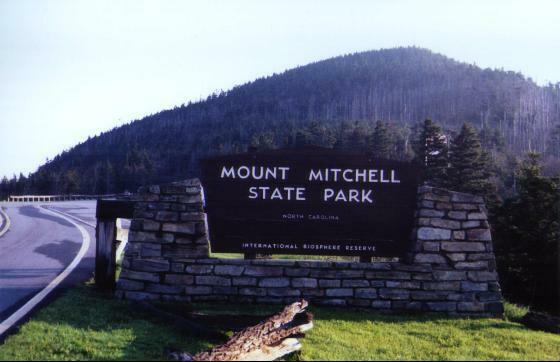 A wise friend told me that the Assault on Mount Mitchell is like a rite of passage for cycling. It is not something that is necessarily enjoyable, but it has to be conquered at some point. The event is a big deal, with over 1,500 attempting the big mountain and many others doing the shorter ride to Marion. From what I understand, there can be between 2,500-3,000 attendees. Phew. I get tired even thinking about it. Logged approximately 2,000 miles on the bike. Participated in seven ‘century’ rides (100 miles). Five ‘metric century’ rides (62 miles). A handful of P90X sessions, ab exercises, pushups, sit-ups, etc. It sounds like a lot, but the season has flown by. Gradually I have improved from around a 14-15 mph rider to about a 18-19 mph rider in the flats. Although still a new rider, I have taken a crash course into the world of cycling and am probably now in the best shape of my life. The biggest test of my fitness was the weekend before last at the Tour de Cashiers. Overall the mileage and climbing is comparable to Mitchell, but the difficult parts are spread over three steep climbs. Many say that Cashiers is tougher than Mitchell, and even though I struggled, I am bringing some confidence with me on Monday having completed the challenge. To keep things in perspective, however, I remind myself that this is a different type of ride. The longest climb I have completed to date is Caesar’s Head mountain, approximately 6 miles. Mitchell will be four times that. The weather report looked sketchy early in the week, but as of now looks relatively clear. There is still a good chance of seeing some rain, especially as we get closer to the top where the weather gets more chaotic and less predictable. I will be prepared for wet or dry. The temperature at least looks comfortable, probably starting in the 50s and getting up to the low 80s. I feel good. I can do this. My expectation from what I’ve read about the course and discussed with others is that I will finish somewhere between eight and nine hours. For what it’s worth, Cashiers was less than seven hours ride time but with a LOT of stops. Time is not as important this time, and I will take breaks if needed, but I am hoping to keep rests to between 5-10 minutes each. My goal for this ride is, above all, to finish. Even though I feel prepared, there is no telling what can happen. Secondary, more ambitious goals are to not take too many rest stops, maybe five max, and not stop at all during any of the climbs. The weekend festivities will begin on Saturday, where I will attend a free film about Mount Mitchell, and later in the evening participate in the Velo Social gathering. I probably will not be posting about these events, but will be tweeting and maybe taking a few pictures throughout the weekend. Thanks for all the support. Wish me luck – I’ll need it! This entry was posted on Thursday, May 12th, 2011 at 8:30 pm	and posted in Rides. You can follow any responses to this entry through the RSS 2.0 feed. Best of luck. I’ll be waiting to read your report. That elevation chart looks scary! Well, no turning back now. There will be tons of people out there, so the chances of running into each other will be fairly low. We’ll see! Maybe I’ll bump into you at packet pickup, or maybe you’ll pass me on the big mountain. Have a great ride out there! Hope you have a great ride! That looks like some serious elevation man. Can’t wait to hear how it goes!